I looked through my Diigo groups earlier in the week, just to see what I would find, and this site stuck out for me. 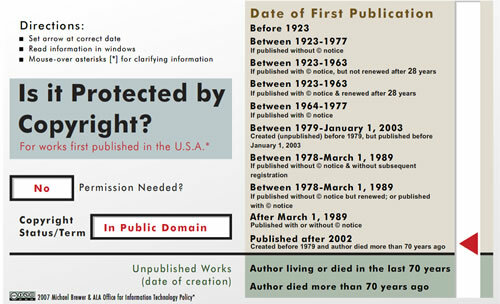 It has to be by far one of the simplest, and easiest to decipher, websites I’ve ever seen addressing whether a published work is copyrighted or falls under the public domain. With it’s handy little red slider arrow, you can quickly ascertain whether a work that you’re studying, or would like to use in a digital media project, falls under any current copyright restrictions. That’s not to say the Digital Copyright Slider will help you determine how to go about using copyrighted materials for fair use exemptions, but rather it would serve as an excellent companion site to Tom Woodward’s website about copyright and fair use. As copyright laws have continually been amended, the most recent overall being the HUGE Digital Millennium Copyright Act, the concept of a creative work being in the “public domain” becomes increasingly foreign. The digital slider helps clear up any confusion, and gives you a simple yes/no/maybe answer to whether a work is copyrighted, and it’s current status. Want to publish your own sequel to “1984” similar to the unauthorized “Catcher in the Rye” sequel published this summer by Swedish author, Fredrik Colting? Sorry, you’ll have to wait until at least 2018. Thank you for this information. I find it extremely useful, because the middle school students I teach, once they understand the words “copyright” and “plagiarism’ thoroughly, often feel discouraged when they need to figure out whether they can use materials in their digital projects, and the links you have provided will make it easier for them (and for me!). Of course, some of them would just like to continue to slide in “stolen” pics from Google Images, but I’m going to continue to fight for them to understand how to use media responsibly. I will also check out the Woodward site. Thanks again. Great post!! Very useful for writers and content developers. Instant revision possible with this. Great Post I will have to share with a group of Integration specialist here in Arkansas..